I’m not Jewish. Actually, I’m not really religious at all. Technically speaking, I’m Catholic, but really, I don’t subscribe to any specific faith. I think there are some really great Christian ideologies. There are also brilliant philosophies in pagan and Eastern religions. I firmly believe in embracing different cultures and celebrating diversity. In fact, when I think about how I will raise my future children, I plan to expose them to a variety of religious philosophies and traditions. When it comes to religion, the things that really intrigue me are the rituals and traditions. I love how these tie in with people’s beliefs and stories. In many ways, I feel like these traditions bear far more importance on our lives than dogma. So to celebrate Hanukkah, I decided to try my hand at making latkes. Potato pancakes are a pretty common cultural dish. 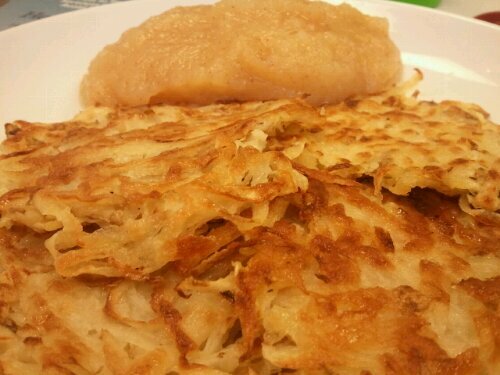 My German and Swedish heritage both impart the potato pancake tradition upon me. But since we’re celebrating Hanukkah here, let’s take a brief moment to look at the dish as it applies to Jewish culture and Hanukkah. And there we have your history lesson for the day, now on to the food. I knew what I needed to make my latkes, but I was sure about the proportions. I consulted a few recipes for ratios so I didn’t end up with enough latkes to feel an army. Cooking Light has a great recipe if you’re not comfortable winging it. Shred the onion and potatoes using a food processor or grater. Press as much moisture out of the potatoes and onions as you possibly can. I threw them in a colander and pressed them as much as I could. One of the recipes I read suggested using a clean dish cloth or cheesecloth to wring out the potatoes but as I was at the boy’s house and had neither, I couldn’t try this method. Or, in my quest to make perfectly crisp hash brown, I’ve seen the suggestion to use a potato ricer, I expect that would work here if you have one. While the potatoes were being pressed in the colander, beat the egg and combined it with the flour, salt, and pepper. Once the potatoes and onions are sufficiently dry add them to the egg mixture. I used my hands to mix them together. Heat oil (2 T at a time) in a large skillet. Form your latkes using about ¼ cup of the potato mixture. Cook until golden brown and then flip. Place finished latkes on a cookie sheet in the oven to keep them warm while making the next batches. I set the over at 250. I hate sour cream so I served mine with applesauce on the side. The boy used pancake syrup, BBQ sauce, and maybe some ketchup. My latkes got the stamp of approval, but there are a few things I would suggest/ do differently for the perfect potato pancake. If you have a food processor, use it! I was too lazy to drag my ancient food processor (which I’ve lovingly named Greta,by the way) over to the boy’s house so I brought my, much lighter and easier to transport, grater box instead. I regretted this instantly. Shredding onions is a nightmare! Next time I’ll use less onion. Don’t get me wrong, I love me some onion, but these were a bit heavy on the onion. It wasn’t bad, but the onion overpowered the potato a bit. Get more moisture out of the potatoes and onions. This really prevents them from nicely crisping up. Now I’m off to find other holidays or traditions that call for potato pancakes so I can perfect my technique.